French President Francois Hollande said the new U.S. government was encouraging 'populism and even extremism', as he and fellow southern European leaders urged unity to face an increasingly uncertain world. "We have to stand together in Europe," Hollande said during the meeting in Lisbon. "What is at stake is populism. The kind of discourse now coming from the United States encourages populism and even extremism." Hollande was speaking at a meeting of southern European leaders in Lisbon, which showed growing concern of threats to European unity at a time of Britain's departure from the EU and growing populism. The leaders, who face risks ranging from Europe's refugee crisis to slow growing economies and high debts, said in a joint declaration they confront a world with "growing uncertainties and instability," making European unity yet more important. "Weakening Europe is not an option," they said. The group, which is sometimes referred to as "Club Med", includes France, Italy, Spain, Portugal, Greece, Malta and Cyprus. None of the other leaders spoke directly about U.S. President Donald Trump's administration, but they showed their determination in opposing protectionist trade policies that Trump is promoting. "We need to develop a robust trade policy based on fair exchanges, the promotion of our standards and the safeguarding or our way of life," the declaration said. "Protectionist reactions are not the right answer." Concerns that populism could further undermine the European Union after Britain's departure have focused on the threats to mainstream governments at elections this year in the Netherlands, France and Germany. In France, far-right leader Marine Le Pen leads opinion polls in the first round of the election in April, although they show her losing in the second round in May. And in Italy, the populist 5-Star Movement is the second-largest party as the likelihood of elections this year rise. "We have a message of confidence and hope regarding what we are and what the European Union has achieved over the past 30 years," said Italian Prime Minister Paolo Gentiloni. "It is not necessary that 2017 will be a year of crisis for the EU." This meeting of the leaders is the second of what are planned to be regular gatherings. At the first meeting of the group in September in Athens, the group called for European measures to boost flagging growth. At the time, German officials urged the group not to push for fiscal relaxation of EU rules. The leaders talked about the need for economic convergence with richer northern European countries and policies to boost growth, but they stressed the need for cooperation with all of Europe at this time of uncertainty. Still, the clout of the "Club Med" nations is likely to grow as with Britain's departure from the EU it is set to gain a blocking minority on EU policies. 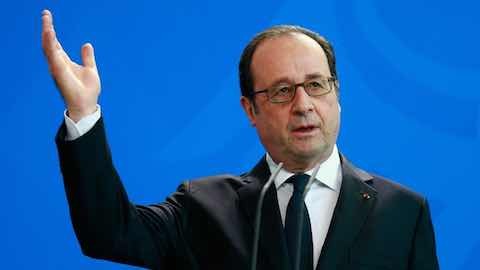 Europe: "Hollande Warns of American 'Populism'"